My first children’s picture book! Click on a link below to be taken directly to the section. More coming soon! Author (Um, me): Karen Dobyns, an occupational therapist. 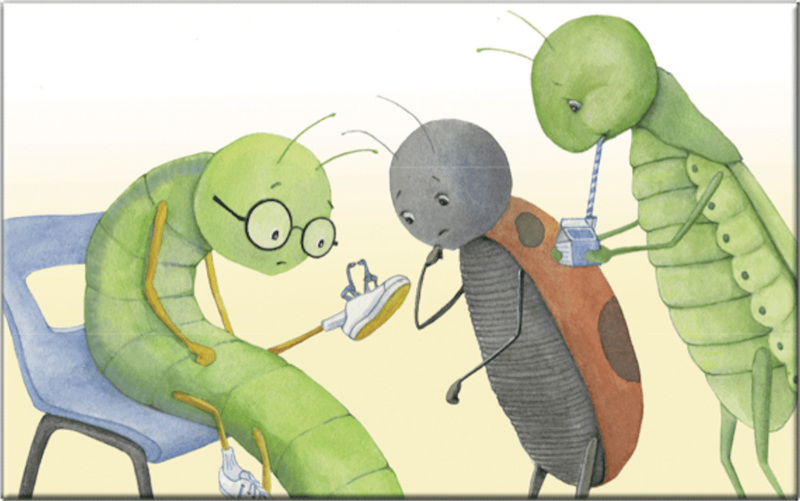 Illustrator: Maria Koch For more information, visit my illustrator page. Formatting: Font, sizing, spacing, layout, and even the artwork, was deliberately chosen/created to maximize visual ease for readers, especially those with visual challenges. 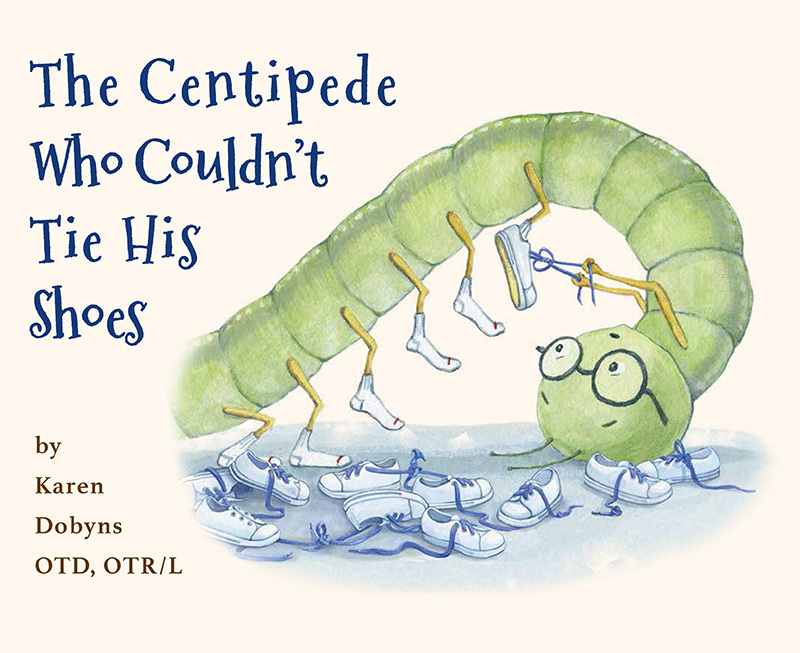 Ben the centipede is a 2nd grader, and he’s horrified to realize he’s the only one in his class who doesn’t know how to tie his shoes! The class bully is happy to point out that Ben is wearing “baby shoes” (Velcro-style fasteners). Ben is elated when his mom comes home with 50 pairs of shoes with laces, but is deflated when he realizes it’s harder than he thought to tie them. Ben has a visual disability called low vision, meaning he can’t see as well as other kids even with his glasses, and to him the laces just look like a “jumble of spaghetti!” He ultimately requires the help of an occupational therapist, Miss Amanda. She introduces him to dual colored laces (where half the lace is a different color than the other half so it makes it much easier to tell the two loops apart), which helps a lot. But Ben has 100 feet, and now realizes that 100 shoes would take a long time to tie! Miss Amanda shows him no-tie laces, too, but none of the other kids wear that kind. Now it’s up to Ben to decide what he wants to do. After all, he loves playing kickball at recess, and he wouldn’t get to play much if he had to spend all his time tying shoes. On the other hand, wearing no-tie laces would make him look different from the other kids, and being teased or bullied is no fun. Hmm, Ben has a lot to think about. And even Ben is surprised at what ultimately ends up happening! Author’s note: As an occupational therapist, I’ve always wished that the general public was more aware of the many helpful tools and strategies used regularly by occupational therapy practitioners. For example, dual colored laces make it easier for ALL kids to learn to tie their shoes, due to the increased contrast. Why aren’t all kids running around with adorable dual colored laces? I’ve also wished the public was more aware of what occupational therapy is and how useful it can be. I love books and creativity, and became aware that children’s books were often the easiest and most noninvasive way to expose children to new ideas, educate them, and start conversations. For my doctoral capstone project in OT, I researched bibliotherapy in depth, looking at how children’s picture books can be used to increase awareness and acceptance of children with disabilities, and in OT in general. I’ve found through my research that few children’s picture books have occupational therapy mentioned in them (big surprise right?) and also that many of the books about disabilities tend to be a little heavy-handed, with the disability being the main focus, rather than the child. Also, many of those books were written in a way that would not appeal to the average child. My goal was to write an entertaining and educational story that could include OT and disability in a way that lead to awareness and discussion, while not being the focus of the story. Whether or not I succeeded in my quest will be up to you. Inside the book you will find extra sections with information for young readers as well as their adult readers, including suggestions of topics to discuss. For example, fair is not always equal. Ben has 100 feet – is it fair that in order to fit in he should wear shoes with laces when other peers may only have 2 or 8 feet? Teaching shoe-tying: Tips and Tricks By an OT, Tonya of TherapyFunZone.net, which is one of the best pediatric OT resources out there – and she also has an awesome shop. Clever Ways to Teach Shoe-Tying to Kids By an OT, Christie of MamaOT.com, which is also a wonderful resource for all things related to pediatric OT. Note: In the pediatric OT world, most of us don’t worry too much about whether kids can tie their shoes until around the age of 8 or second grade. So if your 5 year old hasn’t gotten the hang of it, don’t stress too much. In addition, no-tie laces or fasteners are more popular these days even in older kids, so it’s not as big of a deal as it used to be. (Kind of like drivers are no longer required to know how to use a stick shift.) However, learning to tie a shoe knot is useful for many other reasons and if possible, it should be taught. There are lots of great resources to look at online, and/or you can contact your pediatrician or other pediatric specialists (such as an OT practitioner) if you’re suspecting something is wrong. But ultimately, if your child can’t learn for whatever reason, it’s okay. There’s now lots of awesome alternatives to shoe-tying. The OT in the book, “Miss Amanda,” is named after Amanda Gretsch, one of the most talented pediatric OT’s I’ve ever met. She owns and runs a private clinic in Encinitas, California. Ben has low vision, and that’s why he has a magnifier on his desk, and sits in the front row. It’s also why he had so much trouble with the “jumble of spaghetti” shoelaces as he needed more contrast (actually almost all kids do better with more contrast). Note: There is often controversy about how disabilities are portrayed in media, and when writing this book, I spoke to multiple low vision therapists and people about how Ben’s low vision was portrayed. Some felt that Ben wearing glasses was “stereotypical” and that many people with low vision do not wear glasses, while others felt it was quite common of the children they worked with. Since low vision is such an umbrella term, low vision can look very different for one person versus another. I sincerely hope you were not offended by how I portrayed Ben and his low vision in this book. I know there is also often controversy about using the term disability versus impairment versus differently abled, etc. Please feel free to contact me for further dialogue. Here are some sites you can buy the products introduced in the book. And/or feel free to do your own Google searches! Pictures coming soon. In this book, the OT, Miss Amanda, introduces Ben to dual colored laces (where half the lace is a different color than the other half) because it dramatically increases the contrast of each loop and makes it much easier to see what lace is doing what! Easy Tie Shoelaces have a snap in the middle so you can swap out colors. They’re not too floppy which makes it easier for them to keep their shape. They also offer a textured version, which can be helpful as well as it makes it easier to distinguish the two sides using touch. The OT also introduces Ben to no-tie laces, since spending all his time tying his shoes wouldn’t leave much time for play. There are now lots of different types of no-tie laces on the market, and I highly recommend you look at their FAQs/product descriptions for help in deciding what’s best for your child. Hickies are called laces or straps, and they’re made of a flexible rubber. 2nd: *OT Dr. Anne Zachry, author of RetroBaby and RetroToddler, as well as blog author Pediatric Occupational Therapy Tips, reviews the book and is also having a giveaway! 3rd: *OT Tonya of TherapyFunZone reviews the book and also teaches you how to make an adorable two-toned knot-tied jellyfish! Questions? Comments? Contact me via gmail (karen.dobyns) or my Miss Awesomeness Facebook page on sidebar.